All the best Bodybuilding.com Gold’s Venice Tee deals in one place! 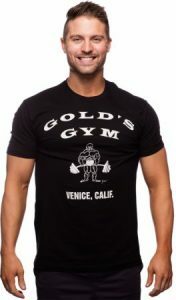 Compare prices from all the top online stores to find the best price on Bodybuilding.com Gold’s Venice Tee. Fitness Deal News does the hard work for you of finding the best deals & coupons on everything fitness. The Original Gold’s Gym T-Shirt Designed By Ric Drasin In 1973! At last the ORIGINAL GOLD’s GYM T-Shirt designed by Ric Drasin in 1973 is now exclusively available through ONLY! This shirt is not sold by Gold’s or any other outlet at this time. It’s one that you will want for your collection as it bears Ric’s Signature right on the shirt. Ric designed this shirt while having lunch with Ken Waller and Arnold Schwarzenegger at Zucky’s Deli in Santa Monica on a napkin at their table. It grew to be the most recognized brand in the world. Don’t be mislead by others. This is the ONLY one available that’s a vintage design with Ric’s signature. Measure around the fullest part, across the chest point, keeping the tape horizontal. With arm relaxed at your side and slightly bent, measure from center back neck, over point of shoulder, down the outside of the arm to the wrist. Powerful compression fit boosts strength, drives peak performance and maximizes muscle recovery. Every workout is a war; this is your armor. Breathable, next-to-skin fit supports intense exercise without the weight of heavier fabrics. Wicks sweat, without the squeeze. Tailored, not tight. Promotes lightweight mobility, full range of motion and comfortable movement. Speed in style. Loose cut promotes a superior range of motion, ultimate comfort and maximum breathability. Lift hard; lift comfortably.